This article is about the Japanese bath. For furo (風炉), the hearth used in Japanese tea ceremony, see Furo (brazier). For the fish genus, see Furo (genus). Furo (風呂), or the more common and polite form ofuro (お風呂), is a Japanese bath and/or bathroom. Specifically it is a type of bath which originated as a short, steep-sided wooden bathtub. Baths of this type are found all over Japan in houses, apartments and traditional Japanese inns (ryokans) but are now usually made out of a plastic or stainless steel. A furo differs from a conventional Western bathtub by being of a deeper construction, typically in the region of 0.6 m (25 inches). The sides are generally square rather than being sloped. They generally have no overflow drainage. Traditional pot shaped cast iron furo were heated by a wood-burning stove built-in below them. 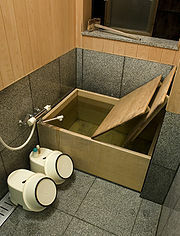 Furo (or yubune (湯船) that specifically refer to the bath with water) are usually left filled with water overnight, and for some household the water reused or recycled for washing clothes the next day. As in the West, it was the custom for more than one member of the family to use the same bath water and therefore, for the Japanese, it was important to be completely clean before entering the bath. This type of furo was the precursor of the modern Western-style hot tub. Furo are part of the Japanese ritual of bathing, not meant for washing but rather for relaxing and warming oneself. Washing is carried out separately outside the yubune. The bather should enter the water only after rinsing or lightly showering. Generally Japanese bathrooms are small by Western standards, so the bathroom is set up much like a walk-in shower area but containing the furo. Since the bathroom is a complete wet area, in modern buildings and ryokan heating is provided by air conditioners overhead. The water is hot, usually approximately 100 to 108 °F (38 to 42 °C). A modern furo may be made of acrylic, and the top of the range models fitted with a re-circulation system (oidaki) which filters and re-heats the water. This system is connected with the hot water heater, either for gas/propane fired or electric/heat-pump types. Luxury models are still made out of traditional or expensive woods like hinoki, and can be retrofitted with Western-style fittings and used as signature pieces by architects and interior designers internationally. Wikimedia Commons has media related to Furo. This page was last edited on 13 February 2019, at 03:37 (UTC).